Geometry is a branch of Mathematics which deals with the study of shapes and their properties. A polygon is 2-dimensional figure which has straight lines connected together to form a closed shape. It is important to note that a polygon does not have curved sides. The straight lines form the sides and angles of the polygon. The word ‘poly-’ means many and ‘-gon’ means angle. Based on the number of sides a polygon has, they are named differently. For instance, a triangle is a polygon with 3 sides, a rectangle is a polygon with 4-sides. Now, a polygon which has 5 sides, thus forming 5 angles is known as the Pentagon. The word ‘pentagon’ refers to ‘penta-‘ meaning 5 and ‘-gon’ meaning angle. Pentagons are very commonly observed in various geometric calculations and thus play an important role in geometry. As shown in the diagram below, a pentagon has 5 vertices and 5 edges (or sides). Pentagons are classified into 2 types based on their side measurements. The 2 types are Regular Pentagon and the Irregular Pentagon. Regular pentagon is a pentagon which has all the 5 sides of equal lengths. This also implies that all the 5 angles of the regular pentagon are equal. However, for an irregular pentagon, all the 5 sides and the 5 angles are not of equal measurement. This can be observed in the diagram as shown below. 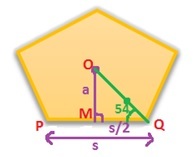 Pentagons can also be classified into 2 types based on their angle measurements. The 2 types are Concave Pentagon and Convex Pentagon. Convex Pentagon: But if all the interior angles of a pentagon are lesser than 180°, then such a pentagon is known as the Convex Pentagon as shown in the figure below. · In a convex pentagon, all the vertices point outward away from the interior of the pentagon. · A line drawn through a convex pentagon will intersect the pentagon twice. · All the diagonals of the convex pentagon lie inside the pentagon as shown in the figure below. Concave Pentagon: If one or more of the interior angles of a pentagon has a measure greater than 180°, then such a pentagon is known as the Concave pentagon. These are opposite to the convex pentagons. · In a concave pentagon, vertex appears to be pushed inside the pentagon. 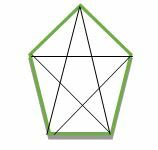 · A line drawn through a concave pentagon (depending on where the line is drawn) can intersect the pentagon at more than 2 points. The figure below shows that the line drawn intersects the pentagon at 4 points. · Not all diagonals of a concave pentagon lie inside the pentagon. Some of the diagonals may also lie outside as shown in the figure below. We can find the sum of all the angles in a regular pentagon as well its each interior and exterior angle. 4) Diagonals of a polygon: Diagonal of a polygon is a line segment that joins any two non-adjacent vertices. Therefore, number of diagonals in a pentagon of 5 sides = 5 * (5 – 3)/2 = 5 diagonals. Perimeter of a polygon (regular or irregular) can be easily calculated by simply adding up all the side lengths of the polygon. Example: Calculate the perimeter of a regular pentagon whose side length is 6m. (Note: Apothem of a Polygon is the perpendicular line segment drawn from the center of the polygon to the midpoint of one the polygon’s sides). Area of an irregular polygon: This can be calculated by dividing the polygon into set of triangles, and then adding the area of each triangle to get the total area of the irregular pentagon. Example: Calculate the area of a regular pentagon if its side length is 6m.